Making Custer State Park with 2,129.5 miles behind us, as I hurriedly gather the last of the pics together, we have 196 miles left is almost happening! Our newest adventure in the Black Hill of South Dakota will involve work camping three days a week and four days to explore and enjoy one of our favorite spots from our Short, Short Trailer, Long, Long Trip back in 2016. We left Home 12 days ago, and for the most part we have putted across the States to our destination. (Look it could be done in 30 hours and there was a time when we were that crazy dumb!) Instead we scheduled a leisurely two nights at each camp ground, we did some kayaking, some motorcycle cruising, bicycle riding and hiking. With only a minor last minute change to our plan, I’ll explain later, we enjoyed the trip. Estimate: 212 miles, 3- 1/2 hrs. Loved this campground, and I don’t know how we’ve never done this one. We unloaded the kayaks and did a relaxing three hours up to the spring head and back. Took some time to splash in the cool water and got back to the camper just as the afternoon storms blew through. Did I mention I’m not missing everyday rain showers! We only used our kayaks, they also had tube rentals and a shuttle service, which was probably a nice float downstream from park. After the afternoon showers, we rode bicycles through the park and down to the tube drop off area, which was a nice paved road with no traffic because it’s only for the shuttles. Estimate 320 miles, 4-1/2 hrs. This was a quiet and peaceful park just off of I75. Temps were nice in the shade. Not a lot to do, a couple of hiking trails, and other activities on the lake above the dam. We hiked along the Towaliga River to the abandoned hydro plant (that might have brought back work memories for someone), and on our second day we took a motorcycle ride into Jackson for some lunch at Zaxby’s. Definitely felt strange to not be pushing by traveling everyday. Estimate: 291 miles, 4-1/2 hrs. The mud aside (lots of rain and new grass hasn’t come up yet), this was one of our favorite stops. Early morning hike down by the butterfly garden yielded a deer encounter as well as lots of birds, a turkey, rabbits and of course butterflies. The road that bisects the park was great for our road bicycles and we took a ten mile ride on a cool afternoon. Our only issue with this park was the Atlanta traffic (we planned to miss rush hour and got stuck by an accident) and again in the area where you pass back and forth between TN and Ga a few times (no accidents, just stop and go traffic). We found out too late that there was a cave on site, so we have a reason to return and explore some more. All sites are gravel and mostly sloped, was able to barely push MC up into site. We had a little bit of trouble with the motorcycle trailer at this campground, but not enough to make us reconsider towing it with us. At each site, we have to unhook it and push it into place before we backup the camper. The slope into the site was a bit steep and we couldn’t place the trailer behind and hook it up before pulling out, so we had a little extra maneuvering. I took and early morning bicycle ride down the the Meramec River, and had to walk the bike back a good bit of the way! Florida girls and steep hills…gonna need to figure out the gears and get the thighs in better shape! Our walk to the nearby cemetery was cool, many very old stones from late 1800’s and early 1900’s. Unfortunately the take away was a load of ticks on the dog…and chiggers for the people! Lessons to learn. We also hiked the 2.6 Lost Hill Trail which would around the creek and highest part of the park. $50.50 only stayed one night (too late to get refund). Estimate: 264 miles, 4-1/2 hrs. Campsite #005, no h2o at site, most other sites are more shaded. Site is also next to camp host but nicely spaced. All sites are paved and mostly level. We got here’s bit late and decided to move closer so we could enjoy more time at Palisades in South Dakota. We rode our bicycles around the camp area, out to the dog park (which was quite nice, but we didn’t use). Again some steel hills and bike walking for Florida girls! From Interstate 29, take exit 151, which is Hwy. 12 north. Go north on Hwy. 12 approximately 4 miles to the park entrance. Okay, so here was our first camping fail. We arrived at this cute park, with the smallest campsites ever! Bring you cute little pull behind or pop-up, not your 30′ fifth wheel to this park. The huge mud hole created by the camper that got stuck the day before was a big clue. We we fortunate to get turned around and be able to get out without unhitching anything. We re-grouped and called Palisades State Park to see if they had anything for tonight. We were blessed by adding an additional night and they switched our campsite to one right on the creek. $29.97 actual 64.22 (add extra day and $12 for your car). We hiked every muddy trail in the park. The cap host, Merl told us they have had over ten inches of rain in the past week. This is a fabulous park, the river, which we didn’t swim or kayak in had people doing both. The Sioux Quartzite formation are beautiful and I’m sure the trails would be less muddy in a week or so. And here is our BIG CHANGE! We couldn’t get into the area we wanted to Sage Creek Campground. They changed the length restrictions and we are too big. We really don’t care for the parking lot they call the other campground. We considered some local private campgrounds, but in the end just decided to make our final stretch all the way to Custer. Since we aren’t there yet, I’ll share pics of the site on the next blog. I must say this is the first long distance trip for us in many years where we didn’t wear ourselves out to get to our destination…we may just be figuring this thing out. Thanks for sharing our trip with us, we are so glad to have you join us. Day 14 July 1 Custer SP, SD (BECOMES DAY 12 and final day of travel). No More Toys! No, No, No! It’s definitely to warm for the blanket! They brought the shed! No, Russ…you cannot get a shed. Dignity of Earth and Sky. South Dakota rest stop art just before crossing the Missouri River for the last time. Definitely too hot for a blanket today. Our last crossing of the Missouri River. This was fire truck #5 out of we lost count….but awesomely interesting way to pass the miles. Wind turbine blades, these are unbelievable in size. Leave some mud for someone else! “All good things must come to an end”, is not one of my favorite quotes, because I don’t like ending, I’d rather keep going. I did however, Google it, because I didn’t know who actually said this. I found it attributed to Geoffrey Chaucer in his poem Troilus and Criseyde completed in mid-1380s, here. However, I much prefer this source by ireland, “your parents when you turn 18,” which I found here. At least I partially added to my knowledge base today! No sad tears for the end of our Bahamas 2016 adventure, only memories to treasure for the rest of our lives. We both agree this was one of the best trips we have made to date. Cruising with Captain Jack and Cheryl from Zig Zag was as close to perfect as it gets. We learned so much from their experience and knowledge. We shared exploring many beautiful places in the Abacos, and enjoyed our evening beer-thirty get togethers, where we let the pups run around and made a plan for the next day. We were down right challenged to keep up with them somedays, these two have some energy! They kept us moving when we may have opted for out-right lazy. We are already missing them and can’t wait for another opportunity to adventure with them. I really thought that spending three and a half months in the same area, including back-tracking, would get boring. But we found having less time restraints allowed us to get past the rush of getting to the next place or missing opportunities when we couldn’t wait out weather. More time would not have been an issue, in fact, we even have a list of things we did not get to do for the next time we visit! Here are a few pics of our last days and our crossing back to Stuart. The night before we left Grand Cays, we had our final emergency repair of the trip. The hose to the head sink decided it was time to blow when we turned on the pressure water. Fortunately, we have a well stocked spare parts locker and resourceful Captain, emergency repair work completed with no off-hours repair bill. We left Grand Cays early for West End. We had a great sail from Grand Cays to West End. Isn’t Zig Zag beautiful with all her sails up. An early afternoon arrival at West End allowed time for fuel top-off and our last beer-thirty of the trip. Eureka and Nyah enjoying their last night in the Bahamas. Nyah is going to miss this place, she absolutely loves fishing! We left West End at O’dark-thirty in particularly good conditions, not a dog, cat, or first-mate got sick on this crossing! Of course calm conditions mean sailing isn’t the best, but we made good time none-the-less. One of the many boats we passed…maybe we are heading in the wrong direction! Hello St. Lucie Inlet, it’s good to see you and to be home! It would not be a real passage home if we didn’t get stuck by the Roosavelt railroad bridge. Well, I guess we shall slow down and wait. But, several months in the Bahamas is evedent in the Captain’s reaction, mere calm about the hold-up…WOW! Almost sunset over the Roosevelt high rise bridge. No Ka Oi patiently waits our return, she knows where our hearts are, and knows we will be back! It has been such a blessing for us to hear from so many of you. Yes, we are having a great time, but it is so wonderful to know each of you are enjoying our adventure with us. And, as always, we hope our blog will inspire you to stretch out and go do your dream! Stay tuned, this adventure we call life is about to take a slight detour, but this is why we are No Ka Oi, Simply the Best. We can’t wait to share our detour with you. We have made it to the beautiful Bahamas! Around here we call them the ‘Hamas, it’s Nyah’s fault, she can’t make “b” sounds all that well. This will be the shortened version of our last week. When you arrive in the most beautiful places, technology doesn’t always follow. (Maybe that’s why they are still so beautiful.) I had prepared a wonderful, lengthy post and it sits in lala land where I can’t get it for now. We have a limited internet data plan and I really need to focus on enjoying all this beauty. So here’s the cliff notes, more detail will follow when we get closer to civilization. 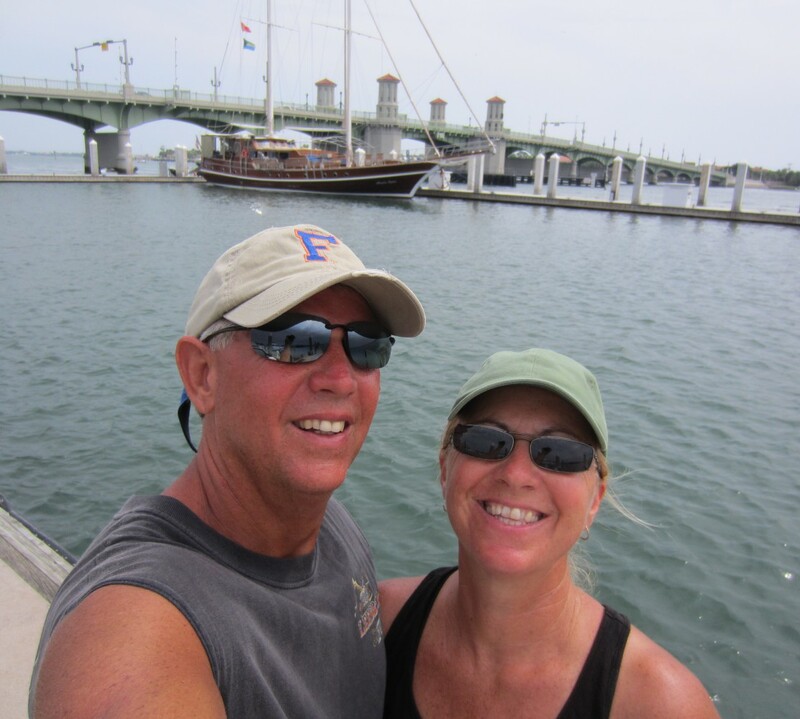 We made a 33 hour passage from Marathon, Fl to West End Bahamas on April 13. It was the best crossing ever! I didn’t get sick!!!! It was flat calm, and we caught fish! We made the crossing with our friends Jack and Cheryl on S/V Zig Zag. After clearing customs and staying the night, we made a quick run for Great Sale to duck out of the wind from a cold front. We stayed until Tuesday, April 19, then made a five hour run to Fox Town for Bahama bread and SIM cards. We stayed one night and moved across the way to Allen Pensacola, which is where we are calmly taking 20-30 knot winds. The island has plenty to explore and nice beaches all around, so we can pick one out of the wind. All is well with the crew of No Ka Oi, we hope the same for each of you! We have limited communications, but get messages here and on Face Book as wifi permits, we would love to hear from you. I’m finding out the hard way that I may be a fair-weather sailor girl. Although we have been doing this for many years on a part time basis, and I thought I knew a lot, I am finding out I don’t know near what I really need to know. I believe in my heart that I can do everything the Captain can do, because at home that is pretty much true, and if not, I push through until I figure it out or come up with an acceptable work around. I can replace parts in dryers and stoves, I can change the oil and spark plugs in the car, use power tools, hang ceiling fans, trouble shoot the swimming pool equipment, and even drive to Pennsylvania, all by myself. But this kind of trial and error doesn’t seem to be working as well out here on the water. We fall into roles of the things we generally do, household things are mine, and boat maintenance things are his. Cooking below is me, grilling is him. Cleaning the bottom, doing the laundry, shopping, repairs, and so on, all have basic owners. This has always worked on our short stints, but, as we work through our transition from part time to full time living-aboard, what we did for short periods of time is probably unfair going forward. Not to mention the list of things that I don’t always want to wait on the Captain to take care of for me is growing. For example, I had to get my dinghy license when we first arrived. I always get a funny look when I say this, because everyone is afraid they missed a new law. In our world, “dinghy license” was the Captain’s blessing that I can handle the dinghy before I go off by myself. I was feeling trapped on the boat, now that we were no longer at a dock. When I complained about this, he took me out and pretty much made me pass a test, so I didn’t hurt myself, others or the boat. I have been driving the dingy every day for a month and a half and feel pretty comfortable and a lot less trapped. Other examples of things I need to know aren’t quite that pretty, like the time I pushed the inverter button to use the microwave, while the generator was running. And yes, we have a system that doesn’t have a fault override for this mistake. I received 101 in electrical systems that sleepless night, until we were able to contact the manufacturer in the morning and find out if it was fixable. Fortunately, it was. In my defense, I asked if there was anything in my world that would possibly lead me to believe that such a mistake could break an expensive piece of equipment. And the answer is no, but this is where I feel at a disadvantage to the Captain’s years of growing up in a sailing family and his mechanical/electrical skills, from 35 years with an electric utility. Aside from going off to sailing, boat mechanic and captains license schools, how will I ever get all the knowledge I need? I have been giving this question a lot of thought, ever since the morning I drew myself a diagram of how the head piping and valves worked, because I was afraid I might accidently pump overboard when it needs to go to the holding tank. This is something the Captain does but isn’t necessary for everyone to do. I don’t have all the categories or a list of all the things I need to know yet, but while we are in our second stage of transition, before we head off on the next leg or our adventure, I need to get more proactive about what I need to get up to speed with and not wait for it to be a crises of mistake. I also know my main source of education will be my Captain, but I am asking these questions, and putting together my list, because sometimes when you know how to do things well, it doesn’t mean that you have a well laid out plan for transferring that knowledge. If you have more experience at this than I do, or if you have any really good resources to help me in this endeavor, please comment below and help me along.